If you've seen one all-in-one liquid cooler, you've seem them all. 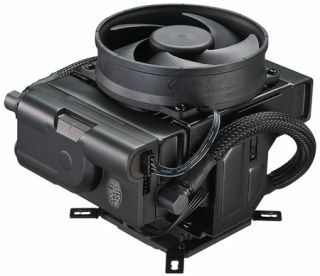 Or not, as Cooler Master was determined to prove with its MasterLiquid 92, a closed-loop liquid cooling solution that looks like an air cooler. The cooler's unique appearance is the result of shrinking things down by combining the radiator and pump into a single frame. Cooler Master then attached two fans to a swiveling mechanism that lets you alternate between vertical and horizontal mounting configurations on a whim. "It has dimensions similar to an air cooler, but it packs a punch for its size that air coolers can’t match. And it rotates. It’s like if you somehow jacked up a mid­sized tower CPU cooler’s performance and versatility without changing its size," said Dorrie Chen, Product Marketing Manager for Cooler Master’s thermal team. Depending on how you have it oriented, the MasterLiquid 92 either blasts air down and, in theory, blankets the motherboard with cool air, or pulls air through your case. Each one has certain cooling benefits, though the decision of going with a horizontal or vertical arrangement could come down to what fits best in the type of case you have and neighboring components, rather than which orientation actually cools better. When mounted vertically the cooler measures 99.9 x 81.6 x 167.5mm and in a horizontal configuration it measures 99.9 x 142 x 118.8mm. It has an airflow rating of 49.7 CFM (max) along with a max noise level of 30 dBA for the fan and less than 12 dBA for the pump. This is an Intel-only cooler with support for LGA 2011-V3, 2011, 1151, 1150, 1155, and 1156. Cooler Master didn't say how much it's going to charge for the MasterLiquid 92, only that it will be "very limited supply" for pre-order starting August 30. It will be available next month.